It’s not easy to decide which of man’s creations is the most beautiful. It may be a work of art, or a garden, or a building, or perhaps, one of Jessica Simpson’s breasts. Once, on a glorious spring morning, I saw the wonders of Venice rising out of some dawn mist and thought it might well be the most beautiful thing I’d ever seen. But then there’s the Queen Mary 2 and the Aston Martin Vanquish. The Hermitage Museum isn’t too shabby either and neither am I ………dressed as gladiator. I had no idea what it was but I had to know. So, I approached the boat marveling at angle of its bow and the positioning of that wraparound windscreen. Then there was the leatherwork in white and turquoise that seems to go so perfectly with the deeply polished mahogany hull, with the whole thing finished off with a tail that tapers and flares just so. Mr. Google tells me that these boats were sold to Stewart Grainger, John Barry, Rex Harrison, Peter Sellers, Brigitte Bardot, Karl Heineken, Sophia Loren, Joan Collins, President Nasser, Victor Borge, King Hussein, Ferruccio Lamborghini, Prince Rainier, Richard Burton, and Pee Diddly. That the most beautiful man-made creation should have come from Italy is no surprise. There’s a passion for aesthetics in Italy that you simply don’t find anywhere else and I think that applies with the man you are about to meet. I actually got to shake his hand many years ago but I am sure he won’t remember. I was introduced to him by one of our captains when our ships were together in St. Martin. Back then he was a captain for Princess Cruises and now…..he is their commodore …….. And if you ask anyone in this great industry everyone will tell you the massive respect they have for him and if you ever wanted someone to drive the most beautiful machine, The Aquarama, a mahogany passport to the high life……….then this would be The Man. 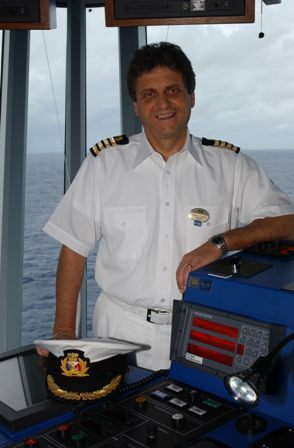 Ladies and gentlemen please meet a true gentleman of the sea, Commodore Romano of Princess Cruises. 1. Please can you tell us about your career so far from the time you fell in love with the sea to your current posting? For over fifty years, the sea has been my life, my work and my love. 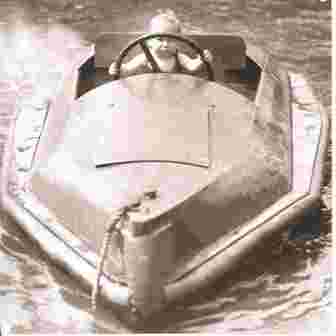 Even as a very young boy, I dreamt about ‘driving’ my own boat. I was born in Sorrento, Italy, which is an old established seaman community. So, for me, it was a very natural choice to go to sea and do what many people from my hometown have been doing for hundreds of years. At age 14, I attended ‘Nino Bixio’ in Piano di Sorrento, one of the oldest maritime schools in Italy. After graduating in 1970, I started my career as a deck cadet on a cargo ship owned by Lauro Lines, an Italian company that also owned the two prestigious cruise ships, the Angelina Lauro and the now infamous Achille Lauro. For six months I sailed from Italy to the Middle East, unloading general cargo merchandise. At that time the Suez Canal was closed to shipping so we had a 32-day trip around South Africa that took us first to Karachi, Pakistan, and then to several ports in the Persian Gulf including Kuwait, Bahrain, Doha, Korramanshar and Basra. In the 1970’s Korramanshar in Iran and Basra in Iraq were two very busy ports on the Shat El Arab. They were beautiful old cities with lots of history, the commerce was fluent and shopping was great. I have a Persian carpet I bought in Korramanshar, which I still treasure today. The work was hard but the benefits were enormous. For the first time, I had a chance to explore parts of the world I’d only read about. And I, like all the sailors before me, was seduced by the sea and her beauty. I fell in love with the freedom sailing gave me. I loved the vastness of the ocean and the sense of adventure I knew awaited me in each port. The world was suddenly mine. Shortly after returning home from this stint at sea, I began my national service with the Italian navy. For two years I served as a radar controller on two Italian navy destroyers. My time in the navy was peaceful but in 1973, after returning to the merchant marines, I sailed on the bulk carrier, ‘Pina.’ We arrived in the Port of Haifa, Israel, and became helpless bystanders in the middle of the Yom Kippur war. We arrived in the port and were waiting to discharge our cargo of grain when the war started. The Pina was blocked inside the harbor for 35 days and, from my vantage point, I was able to see and hear gun battles happening on the nearby Golan Heights and witness several aerial battles over the skies of Haifa. Needless to say, I was happy to finally leave. I spent the next few years on large oil tankers owned by Getty Oil and Exxon International Oil until in 1977, when I was fortunate to land a job as a 2nd Officer on the cruise ship “ Fairstar,” owned by Sitmar Cruises. I knew immediately that I had stumbled on the best of both shipping worlds—I was still able to enjoy the serenity and adventure of sailing but with much better cargo. Excited and friendly faces had replaced merchandise and oil, which made my job much more enjoyable. From 1977 to 1988, I sailed on the Sitmar Cruises passenger ships Fairsea, Fairwind, Fairsky and Fairstar in various deck officer positions. In 1984, I received my first senior appointment as staff captain on the Fairsky. Four years later, Princess Cruises bought Sitmar, and in 1991 I assumed command of the former Dawn Princess. Princess also gave me the opportunity to work ashore for a year in 1994. I worked as fleet captain, based in the Princess marine office in Los Angeles. That was a great professional experience for me, allowing me to complete my overall onboard experience and knowledge of the company. It was also a very special assignment because my first son, Luca, was born that year in Los Angeles. I have now been a captain with Princess cruises for 17 years, and have had the pleasure of being in command of most of her ships sailing all over the world. And just as it was when I was a young boy watching the ships go by in Sorrento, I am living my dream of ‘driving’ my own boat. 2. Congratulations on being made Commodore of Princess Cruises. Can you tell us what the responsibilities of a Commodore are? Commodore of the Princess fleet is a very prestigious title in the P&O history. The title is an honor that is traditionally bestowed upon the most senior captain of a fleet of ships, and the position represents the highest rank attainable to a Princess mariner. This January, I was honored to be promoted to Commodore and follow in the distinguished footsteps of Commodores Quartini, John King, Lagomarsini and many others who I had the pleasure of serving with when I was a deck officer. As commodore I am a point of reference for the company and the other captains who are welcome and encouraged to contact me at any time if they wish to discuss an issue or need advice on anything regarding both the onboard or shore operation. The passengers really enjoy the fact that their captain is the fleet commodore as they understand they have a very experienced skipper at the helm. 3. I am sure you must have seen many changes over the years you have stood on the bridge. As you look at all the technology you have today, what has been the best leap forward that has made your job easier? There have been many changes over the years but some of the greatest technological strides affect the way we now navigate the world’s oceans. The introduction of the ECDIS (Electronic Chart Display and Information System), accurate GPS (Global Positioning System) and the AIS (Automatic Identification System) has made navigation safer and much easier. Back in my cargo ship days, we used paper charts. With them we only had a position history of where the ship had been, but now with ECDIS and satellite GPS, we now have very precise information on where we are at all times, and even a prediction of where we will be by using a time vector. Another great advantage of the ECDIS is that when approaching ports we have a greater choice of range scales we can use and also have a path of where the ship will be in the next 60, 120, or 180 seconds. This is very valuable especially when approaching a small port or maneuvering in extreme wind and current conditions. Another great advancement has been the Automatic Information System (AIS). With AIS we are able to positively identify ships in the area, virtually eliminating any possibility of communicating with the wrong ship. This is helpful when we cruise areas like Alaska and Canada as we are able to identify and see ships around coastlines well before they appear on the radar screen. As a result we are better able to avoid meeting at narrow points. There have also been great strides in the engineering systems of the new ships. With the introduction of more effective side thrusters and the Azipod propulsion systems, ship handling has become safer and more effective. We are now able to enter ports in more extreme weather conditions and with much bigger ships than was thought possible in the past. We no longer need to rely on tug assistance, which at some ports may be unavailable or insufficient. 4. Like most Captains, I am sure many guests ask you “Who is driving the ship?” With all the demands of a modern day Captain, how much time do you actually spend on the bridge and when you are not there, can you tell us the shift pattern of the Officers and Quartermasters? Being a ship’s captain requires a mostly enjoyable but rigorous combination of job skills. We are a mixture of mariner, manager, mentor and master of ceremonies. Dividing my time between the bridge and my other duties is a delicate balance. I like to spend as much time as possible on the bridge because there I am able to better teach my young officers and share with them my experience and knowledge of a particular ship and also pass along my love for this job and for the sea in general. Due to their unique navigational requirements, some itineraries demand more time on the bridge than others. For example, I spend much more time on the bridge while cruising Alaska where there are many narrows passages to traverse, where the weather can be extreme with fog or strong winds, and numerous fishing vessels can create heavy traffic patterns that must be avoided. In the Caribbean, on the other hand, the ship is mostly on open sea with deep waters and good weather so the navigational demands are less. I am always on the bridge at least one hour before making our final approach into a port or narrow passage, as well as on departure until the ship clears the port area and is well underway. I do visit the bridge several times during the day to check on our progress or when we have the occasional visit to the bridge by guests. The officers on the bridge have a set of standing instructions for when to call me, but I stress that they should contact me anytime they need assistance or have any doubts. In addition to the navigation duties, the bridge team is also responsible for the constant monitoring of all of the vessel’s fire detection systems, and must be to able to act immediately in any emergency that might occur day or night. The bridge team consists of a senior officer of the watch, a junior officer of the watch and one or two quartermasters depending on the cruising area. In the Caribbean we navigate mostly on Nacos, or auto pilot, so we have only one quartermaster on duty and a second one available if necessary. While in Alaska, where we hand steer most of the time, we do have two quartermasters on duty at all times. 0800 to 1200 hours and 2000 to 2400 hours. 5. You have navigated ships throughout the world. Are there any ports that you have found more challenging than others and if so, why? You are correct that some ports are much more demanding than others and the challenges are unique to each situation. Much depends on the size and design of the ports. Port traffic is another issue as it has increased so much lately, and the weather and tidal conditions always play a very important role. Many ports in Europe were built years ago when ships were much smaller than today. This makes going in and out of harbor much more difficult. The last time I sailed the Mediterranean Sea was in 1999 on board the Grand Princess. This summer I was aboard the Emerald Princess and was shocked by the growth of cruise ship and ferry traffic in these past eight years. For example, Piraeus in Greece is a harbor we all find very tricky. It has a small entrance and very little room inside the port to turn around and dock. In addition, the traffic is constant with the continuous arrival and departure of large passenger ferries connecting Piraeus to the many Greek islands. For a big ship like ours, this combination of port size and heavy traffic makes docking on a good weather day challenging at best and quite taxing when winds and currents are strong. 6. What has been your proudest moment so far as a Captain / Commodore? My proudest moment as a Captain came the day I was able to fulfill a childhood dream. In Sorrento, there is a tradition that goes back decades. If a captain from Sorrento docks his ship in the port of Naples, on arrival or departure he sails his ship along the picturesque Sorrento coastline while sounding the whistle, saluting the city, his family and friends, and paying respect to the Madonna del Lauro, the local protector of those at sea. When I was a young boy and heard the whistle, I would run down to the beach with so many dreams in my head and the hope in my heart that one day I would be a captain. Forty years later, in 1998, I returned to Sorrento, captain of the brand new Grand Princess, then largest, most beautiful cruise ship in the world. My family and friends were very impressed and returned my salute with a firework display as I sailed the Grand Princess out of port. The feeling of pride I felt that day stays with me still. 7. You must also be very proud to be part of the Princess organization. From your vantage point, what is it that makes Princess so successful and so very popular with its passengers? I am very proud to be part of the Princess organization, which is evidenced by my long 31-year history with the company. I think what makes Princess so successful and so popular with her passengers is that we really do take the time to understand how special cruising is. Cruising is unlike any other kind of vacation. Like me, our passengers have come to love the call of the sea and are thrilled by the sense of adventure that sailing the world can bring. And like me they find true joy in meeting people from all over the world, some who are celebrating special moments in their lives like a wedding or birthday or some who have given into the simple need to get away from it all. We really care that these people — who have so many other places to spend their hard-earned money — choose to spend it with us. We genuinely appreciate them and in return try to give them the best cruising experience possible. Each member of the crew—from our caring cabin stewards to our waiters, engineers and bridge officers—wants our passengers to feel like family. We’re not always perfect, and things do go wrong on occasion, but I think that the majority of people who sail with Princess appreciate the effort we all put forth and that is why we have so many fantastic repeat passengers. 8. How do you relax when you are on board and how do you relax when you are at home? When I am on board I relax by walking around the ship and talking to both passengers and the crew. I enjoy the interaction and am always thrilled when I recognize past guests. I also love to fish. On occasion when we are in port, I will take the speedboat out and do a little fishing. At home I love to spend time with my wife and sons. We will often go fishing or camping. I also like to garden and in fact, am a very good cook! 9. I was talking to our Captain here on the Carnival Splendor, Captain Pagano, who not only knows you very well but has great respect for you as well,. It seems that Italian Captains know each other, regardless of which line they work for. 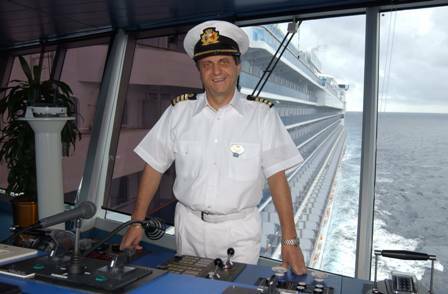 Is there a great friendship between cruise ship Captains and why is it do you think that Italian Captains are some of the finest in the world? The community of Italian captains is strong and we have developed good and valuable friendships with each other. Part of the relationship is social. In past years, when fewer ships were in port and our stay was longer (often overnight), we would get together much more often, have lunch and spend more time catching up. But now we have more requirements concerning safety, security, the environment and passenger concern and our time together is less frequent and often reduced to a quick cup of coffee. The other part of our relationship is professional and we always try to help each other with scheduling arrival times in port, exchanging nautical and operational information, and other tidbits that can help make us more efficient and successful in our jobs. The truth is that fine captains come from all over the world and I am friendly with many of them, as well. We are all a very dedicated group who strive to do our best. But I think what makes Italian captains some of the best in the industry has much to do with a combination of our history and culture. Let us not forget that we are all descendants of Christopher Columbus! But seriously, so many of Italian captains grew up with the sea as our backyard and have a strong bond and a love that greatly influences the way we look at and do our jobs. Additionally, Italians by nature and culture are very rooted in family. Family provides the foundation for the deepest and most important relationships of Italian society and this sense of family extends to our passengers as well as our staff. We are known as some of the friendliest and most approachable captains in the business. This is also part of our Italian nature and the customers and crew love it and respond in kind. There is a definite trickle down effect. A friendly captain tends to have a friendlier staff and crew, which positively affects the passengers. The idea of family really takes hold when it comes to the care and happiness of my crew. These are wonderful people who are away from their families for extended periods of time and that can take its toll. I try to be as available as I can so that they know I am here to assist, coach and help them whether their issues are personal or professional. I, like all of my successful colleagues in command, understand that the care of the crew is just as vital as any passenger service we can supply. Every person who looks after the ship or our guests is an important part of the whole when it comes to providing a safe and pleasurable cruising experience. The bottom line is this: You can command the most beautiful and state-of-the-art ship but without a professional and happy crew you cannot achieve any lasting success. Because when it is all said and done, a good crew makes a good captain. Thank you, commodore, for that wonderful insight into your life at sea. I am sure many readers who have sailed with you will have their own memories of their time onboard and how you truly were the master of their vacation.